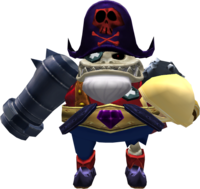 Captain Skull is a boss who appears in Wario World. He is the boss of Sparkle Land, the last of the four worlds, and so is the last boss battled before the final boss, the Black Jewel. He is a skeletal pirate with a hand cannon on one arm and a grappling hook on his other arm. His stage, Captain Skull's Showdown, consists of a wrecked pirate ship with a gaping hole in the middle. Each half has a main deck and a crow's nest. On both halves, there is a ghostly spring that bounces Wario high up to the crow's nest (Wario can also manually climb there via a ladder). The two halves of the ship are separated by water, but a stone slab at the base of the arena, or the ghostly springs, can be used to cross. Captain Skull has a variety of different attacks. He transports himself around the arena using the grappling hook on his right arm, generally avoiding Wario. He may fire multiple flaming bombs at Wario from the cannon on his arm. The bombs pose a danger even after they've cooled, as they can still explode a few seconds later. Captain Skull can also shoot large blue beams at Wario, as well as his pink energy balls that home in on the Wario. If he charges energy into his cannon, Captain Skull will launch a gigantic cannonball that makes a huge explosion on impact. Wario should be on the crow's nest if Captain Skull aims for the main deck and vice versa. When Captain Skull starts to block every punch thrown at him by Wario, he'll eventually become enraged and flash. He then executes a spinning attack, which is his one and only close-range attack. To defeat the boss, Wario starts off having to get close to Captain Skull and punch away at him until he is stunned. He then needs to pick him up and execute a Piledriver or Mega Toss to knock out one of his five health skulls. After losing three health skulls, Captain Skull becomes immune to all of Wario's direct attacks, requiring Wario to throw projectiles at him to continue dealing damage. The player must use the ghostly springs to bounce up to a lookout tower when Captain Skull is atop the opposite one. Eventually, Captain Skull fires volleys of flaming bombs at Wario's lookout tower. Wario must pick one up after it cools off and face Captain Skull in the opposite tower. The player must charge up a Mega Toss, aim at the boss, and fire at him. Wario then must move quickly to reach him. Wario must jump down off his tower and land on the ghostly springs, which propel him high into the air. After landing on the opposite spring to bounce up to the Captain's lookout tower, the player then must pick up the stunned Captain and execute either a Piledriver or a Mega Toss. Less commonly, the same procedure can be followed when Captain Skull fires bombs from the deck, rather than from the tower. Wario may also use the barrels located on the ends of the ship instead of Captain Skull's bombs, but there is a limited supply of these in the arena. Wario must repeat this process until he has knocked out all of Captain Skull's health skulls, defeating him. Wario then receives the fourth and final piece of the Huge Treasure Chest Key and gains access to the final battle with the Black Jewel. Captain Skull, as he appears at the beginning of the battle. This page was last edited on February 13, 2019, at 05:46.